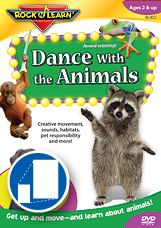 We recently had the chance to review a DVD from Rock 'N Learn, Dance with the Animals. "In this action-packed DVD video, amazing and adorable animals inspire children to learn creative movement, motor skills, listening, and following directions. Delightful songs and exciting live footage of more than 60 creatures captivate children as they learn fun facts about animals-where they live, what sounds they make, how to care for pets, and so much more. For ages 3 & up. Approx. 45 minutes." What we thought: Once again, the kiddos are in love with a DVD from Rock 'N Learn:) This time the DVD is full of cute and cuddly animals. The live animal shots really caught the kid's attention and kept them watching while the fun songs and interactive dances really got them involved. This DVD is actually full of information about animals, their habitats and even tips on how to take care of pets. I really love when my kids can watch something that is both entertaining and fun for them which has always been the case with the DVDs from Rock 'N Learn. ABCD Diaries gives Rock 'N Learn's Dance with the Animals DVD an A+! Giveaway ends Thursday, September 8, 2011 at 11:59cst. Winner will be chosen via random.org and emailed. They will have 48 hours to reply. Open to US residents 18+:) No PO Boxes. I love Rock N Learn and I wish I could get all their educational DVDs and CDs. They work so well with my son. I liked ABCD Diaries via Facebook. I liked Rock N Learn via Facebook. I follow on GFC (Steph) and I love the Rock N Learn DVDs. We have several and my kids watch them all the time.